The Scoliosis Treatment method by Clear™ is a ground-breaking blend of techniques and therapies developed to reduce or correct scoliosis in all ages without the use of bracing or surgery. Intensive Care Certification is rigorous, extensive, and granted only to those doctors who have demonstrated complete mastery of the CLEAR Institute protocols. South Florida Scoliosis Center founder and Director Doctor Alexander Greaux, successfully completed the post-graduate training, under founder and director of the Clear Institute Dr. Dennis Woggon. The CLEAR Institute is a non-profit organization dedicated to the research and development of procedures to reduce and/or correct scoliosis without the use of braces or surgery. 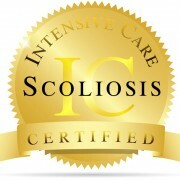 Currently, there are only 16 certified CLEAR Intensive Scoliosis Care Clinics in the world and South Florida Scoliosis Center is proud to join their ranks. Intensive Care Scoliosis Treatment consists of working with scoliosis patient for 2 week periods, 2 times a day. Before and after x-rays are taken to determine amount of correction in the 2 week period. The patient is then sent home to perform an in home scoliosis rehab program for 90-120 days and then reports back to the Intensive Care office for a follow up exam and possibly another round of care. Intensive Care Scoliosis Treatment was created to meet the needs of scoliosis patients who live in an area without certified doctors. Intensive Care allows a scoliosis patient to receive CLEAR™ Scoliosis Treatment regardless of where they currently live. At SFSC we are excited to finally offer a promising protocol of care for treatment of scoliosis that provides hope and possibly a solution to this physically debilitating disease for patients around the world. Scoliosis is a disease of the neuro-muscular skeletal system that causes a severe curvature of the spine, usually accompanied by forward head posture, head tilt, uneven shoulders and an unleveling of the hips. Scoliosis is also associated with shortness of breath, digestive problems, headaches, hip, knee, and leg pain.